Aside from all the customary ceremonies, there will be three sets of talks today. The morning session is dedicated to discussing military reform plans and defense spending on both sides. ITAR-TASS says the Americans consider this the most important topic from their viewpoint. The press service quotes The New York Times saying the two men “simultaneously declared war on longstanding and ineffective bureaucratic organizations,” adding that they’ll find a common language as they compare their efforts. A working lunch will be devoted to nuclear arms control and missile defense. RIA Novosti quoted a Defense Department spokesman who said you can’t meet Russians without discussing missile defense, but it won’t be the main topic of the visit. Today’s afternoon session will cover a variety of regional and global security problems. 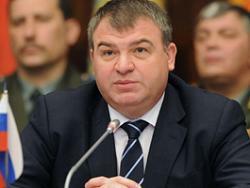 Serdyukov will visit an unspecified U.S. Army base as well as the Naval Academy. Apparently, Gates doesn’t understand precisely. The Defense Ministry already has an answer — to jettison its failed professional contract service program, return to reliance on conscripted soldiers, and see if they can train and retain some professional NCOs. “From the viewpoint of our program modernization the new SOA agreement is a great achievement. Just as the agreements which preceded it. They establish rules of the game which provide transparency and predictability. Modernization programs within the bounds of the new SOA agreement are absolutely normal. We’ll conduct our own modernization. Asked about cooperation on missile defense and the Gabala radar specifically, Gates said the U.S. is interested in Gabala and in the possibility of establishing a missile launch data exchange center [JDEC] in Moscow. This entry was posted in Manpower, Military Leadership, Serdyukov's Reforms, Strategic Forces Modernization and tagged Anatoliy Serdyukov, ПРО, СНВ, Gabala, JDEC, Missile Defense, NCOs, Nuclear Arms Control, PRO, Robert Gates, SNV, Strategic Offensive Arms. Bookmark the permalink.